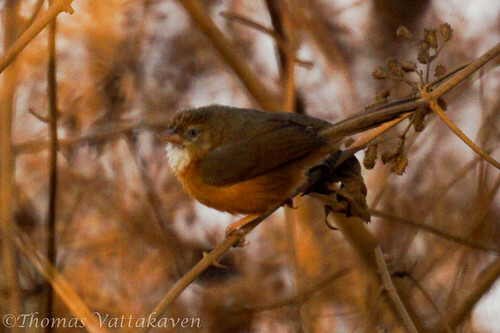 The Tawny-bellied Babbler, (Dumetia hyperythra), also known as the Rufous-bellied Babbler, is a small bird of the babbler family. It has the front half of its crown, a reddish brown and the upper plumage, wings and tail, an olive brown in colour. The sides of the face and entire lower plumage bright fulvous colour. The tail is narrowly barred. There are four races present and only the southern populations have a white throat, as seen in the birds pictured here. This population also has a short supercilium. The legs are a very pale fleshy colour. 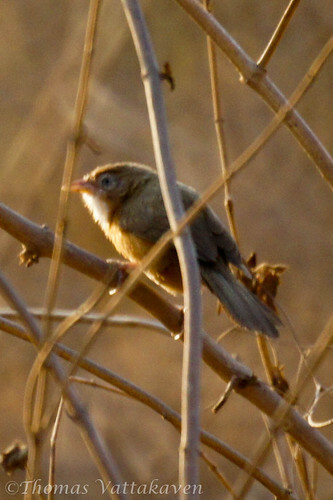 This bird is a bird of thick cover. 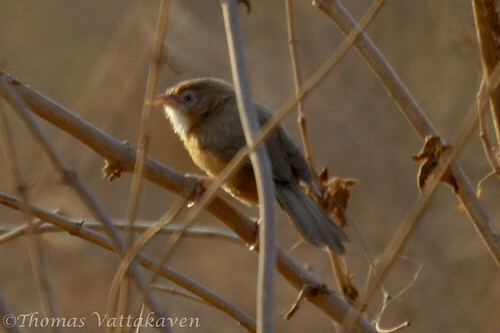 It was difficult getting a good photograph of the bird as they kept to the scrub and only showed themselves briefly. 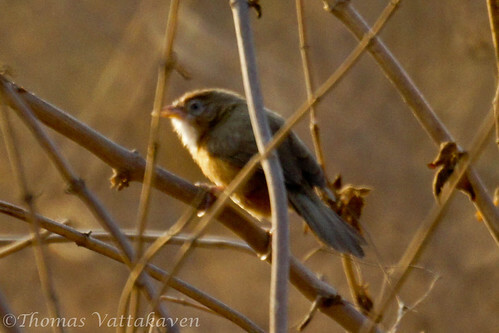 It usually keeps to thorny scrubs, and tall grass in small parties of 4-8 birds. 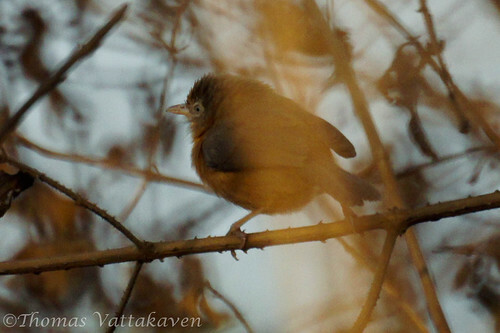 The birds keep in contact using small cheep-cheep sounds along with harsh tittering notes. The birds follow each other from bush to bush, keeping out of sight as far as possible. When an alarm is raised, they scatter in all directions and reassemble when the alarm is over. The food consists of insects and larvae but nectar from flowers is also taken. 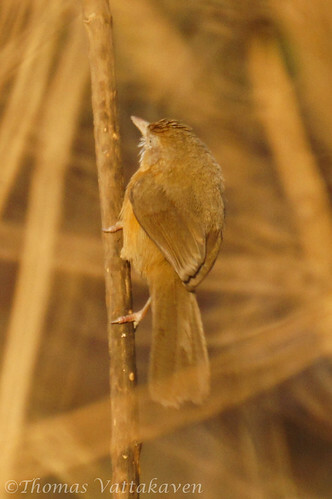 The nesting season of this species is in the monsoon, generally between May and September. The nest is usually built on, or very close to, the ground, either amongst dead leaves, in coarse grass, or in small bushes. It is a ball constructed from bamboo leaves or grass. Three to four eggs are laid. 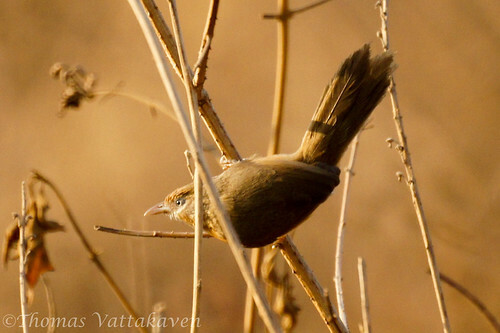 Other Details: A flock of 6-8 birds seen in burnt out thorny scrubs, in close proximity with a group of yellow-eyed and common babblers.